Give us a call at 843-881-9566 and let us know how we can help make your kitchen and bath dreams a reality. We offer free in home consultations. This gives us a chance to see the space you are wanting to remodel or where you want to install an entirely new kitchen or bath design. During this consultation we will discuss your ideas and inform you of all of your options to create your ideal kitchen or bath. We welcome you to come visit our showroom conveniently located on Highway 17 in Mount Pleasant, SC next to Boone Hall Country Store. We welcome you to come visit our showroom conveniently located on Highway 17 in Mount Pleasant, SC next to Boone Hall Country Store. In our showroom you can peruse many styles of cabinetry and other fixtures. Work took about 4 weeks to complete and all of the tradesman he used were very professional and very knowledgeable. I can recommend Jack and I would use him again. His showroom and assistant made the process very painless. There was no going to 5 different showrooms or working with allowances only to find out what you needed cost more. When there were any issues or miscommunications about the work Jack stepped in , responded quickly, and made sure the work was done as I wanted. I thought his price was in line with other estimates we received (ie, a fair price). Jack was extremely good to work with. The estimate we received was very detailed outlining the work to be completed. When work began his employees were here when he said they would be and the work was completed in an outstanding manner. When one crew completed their work another crew was there to continue the job. When I had an issue, Jack responded quickly to see that my concerns were taken care of. The job they did far exceeded our expectations and it was a pleasure to work with them. Such a transformation! We are so pleased with our renovation thanks to Kitchens Baths & Beyond. As a Realtor and owner of my own home staging/decorating business, I understand the value in well planned and well executed renovations. Jack and his team are top notch. The footprint of the kitchen was approximately 100 square feet. Jack, his team and I combined our visions for the space. Kitchen planning in such a small place is no easy task. 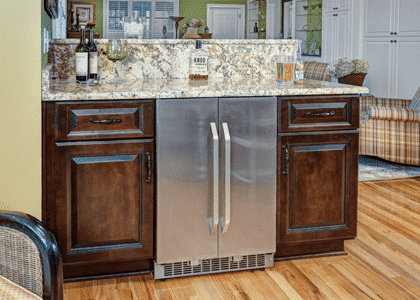 I knew I wanted to open up the space and had a great feel for the types and colors of materials I wanted to use but Jack and his team knew where to put each appliance, cabinet, etc to maximize our small space. They carefully considered each detail, down to the sizes and placement of the hardware. Attention to detail..I love that! That sounds easier than it actually is…they are total pros! Our home lives so much larger! We just downsized from a nearly 3300 square foot home to a 1920 square foot home. We were ready to live a more minimalist life and get rid of the clutter. I hope these pics [Kitchen 20 in Gallery] encourage folks that it is possible to maximize your space and create the kitchen of your dreams, even if it is on the smaller scale. We have PLENTY of cabinet space and tons of counter top space with our massive 11 foot island where there used to be a wall. The home lives and entertains so well now. This is our second time doing business with Jack and his team and we highly recommend them. Jack’s visits on site to make sure things are going well and that you are satisfied with the work do not go unnoticed. I can think of very few businesses where the owner of the company is so involved and makes you feel like a valued client rather than just another renovation. Jack’s team is impressive. I would not hesitate to recommend them. It was a pleasure to work with Kitchens, Bath and Beyond for our kitchen renovation. They are an efficient, hard-working team and they provided excellent customer care and communication throughout the entire project. After receiving proposals from other renovation companies, we chose to work with Jack because his initial estimate was very detailed, therefore avoiding surprises to our budget. The designer, Brittany, was the only designer we consulted that could make our pocket doors work into the construction design. Throughout the job, she also provided insightful knowledge of products and gave us many helpful ideas and solutions for the finishing touches. Additionally, the office manager, Jackie, is very prompt to respond to all calls and emails. And finally, the construction crew was not only professional in their trades, they were respectful of our space and schedules. We put off doing this project for many years because we dreaded the chaos and uncertainty involved in a renovation. The KBB team put all those fears aside and gave our home the renewed and refreshed space we really needed. I highly recommend Kitchens, Bath and Beyond as a locally owned small business, capable of handling any job – large or small. You’re all top notch in your profession. Thanks again. 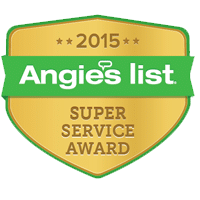 I started working with KBB a few months ago after purchasing an Angie’s List deal. I live in a 80-year old condo in downtown Charleston. The upstairs was in need of a remodel – it has two bedrooms, 1 small bath and awkward closets. 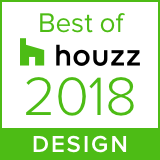 Jack & his team provided a very thoughtful and value-minded design that improved the functionality of my upstairs space while staying within the confines of my budget. They also provided an extremely detailed and well thought out estimate. I signed a contract in June & they started work in September. The work took a total of 4 weeks/3 weekends and they were only a couple of days over schedule. Had my house been a “normal” house with straight walls, easy plaster, etc. – I have no doubt they would have been ahead of schedule. I have worked with many contractors in the past and this is my first experience where I did not have to stay on top of them daily. Every night that I checked the progress, I was extremely pleased. They used quality materials, kept the space as neat as it could be kept, and paid close attention to ordinary details that many contractors overlook – like adding more outlets where needed and perfectly matching my moldings and doors to the existing style. They stayed on time and on budget. The only additions to my original budget were items that I requested. They also sent in a cleaning crew at the end and while I will still be cleaning for quite awhile as remodels and plaster work are extremely messy – it really helped having the cleaning crew hit the big things first! I have been back in for almost a week and couldn’t be happier with the end result! I have no doubt I will be calling KBB again in the future! I LOVE my kitchen AND guest bath and the additional space in laundry. Darin and I both very much appreciate the professionalism of your entire team from front office ladies to the on site team. Thanks for taking such great care of us! We’ve received so many compliments. …The renovation is wonderful and just as important, we really appreciate your responsiveness and help especially since we were not local. As such we had to put a lot of trust in you folks and you did a great job on all fronts. … I am sure we will be calling you again when we decide to attack the bathrooms! We have worked with a number of contractors including home builders over the years and found Jack to be one of the most sincere, honest and committed person that we have worked with. His crew did a complete tear out of our kitchen, and 3 ½ baths including the removal of walls, addition of windows and a sliding glass door onto a new wooden deck. Jack would change anything that we were not satisfied with, never trying to bully us into accepting the work. He visited our home every day pointing out any imperfections that were not up to his quality/standard and fix them. Renovation decisions can be overwhelming and having a contractor that is on your side is very reassuring throughout the process. His crew showed up on schedule, were very conscientious and cleaned up after themselves daily. We are more than pleased with the final results and the quality of his work. Do not hesitate to give Jack your business. Jack and Brittany were here and had designs and itemized quotes pretty much immediately. Jack handles all aspects of the job so coordination with contractors was all on KBB. Adding on things such as painting was so appreciated. Any time I came to [KBB] with questions, [they] responded quickly. Our experience with Kitchen Bath and Beyond was excellent. We discussed with Jack what we wanted in the master bathroom renovation and he gave us suggestions. We were able to pick everything from the showroom. A detailed quote stayed solid. The staff was helpful through out the process. Construction teams were always on schedule and they were always polite and respectful. We are very pleased with our renovation. 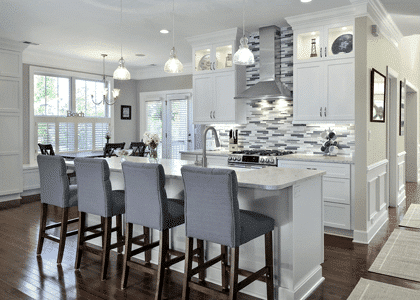 When my wife and I made the decision to renovate our kitchen, we knew the “secret to success” was finding the right contractor to supervise the project…and we most certainly did in Mr. Jack Demsheck. We were in the process of considering two other candidates for the position when we met Jack, who graciously agreed to meet with us in our home, on a Saturday as I recall, to get a feel for the project and listen to our ideas. I was impressed from the beginning with Jack’s engaging personality, his attention to detail, and the sensitivity he demonstrated when balancing our thinking with his expertise and suggestions. He quickly put us at ease with his confidence, not only in himself and the cabinetry he preferred, but in the team of subs he would eventually hire for the particulars of the job. In the end, we were absolutely thrilled with the professionalism exhibited by every one of those craftsmen: plumbers, carpenters, electricians, floor finishers, installers (cabinets, countertops, appliances, backsplash), even the painters. We were “blown away” by the quality of their work and the consideration they demonstrated to us as “visitors” in our home. And – icing on the cake – they arrived precisely when Jack said they would; how refreshing is that? (We were actually so impressed with the painters that we contracted with them to finish painting the entire interior of our house.) 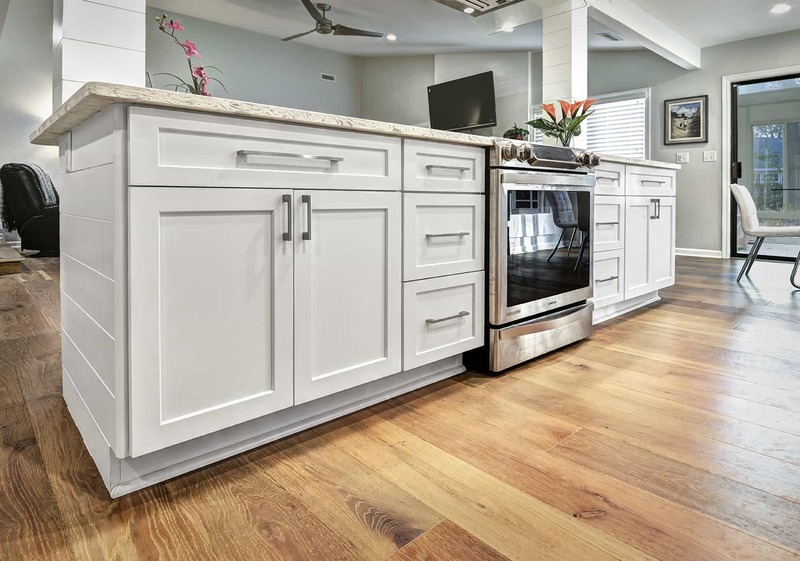 Bottom-line: hiring Jack Demsheck of “Kitchens, Baths, and Beyond” was hiring a team of professionals that transformed our 25-year-old kitchen into the centerpiece of our home today – functional, beautiful, inviting. We’d hire him again in a heartbeat. We have worked with a number of contractors including home builders over the years and found Jack to be one of the most sincere, honest and committed person that we have worked with. His great crew did a complete demo of our kitchen, and 3 1/2 baths including the removal of walls, addition of windows and a sliding glass door onto a new wooden deck. Jack would change anything that we were not satisfied with and point out imperfections that were not up to his quality and fix them. Renovation decisions can be overwhelming and having a contractor that is on your side is very reassuring throughout the process. Do not hesitate to give Jack your business, you will not be disappointed. From the concept of the bathroom, to the design, to the execution of our plan, we were very pleased. We were very impressed with all of the different tradesman working on our project. All of the workers were very professional, polite, punctual, courteous and extremely talented in their respective trades. Every morning, we received phone call from Kitchens Baths & Beyond LLC, letting us know what was on the schedule for the days work, we were never not informed of what was going on or who was coming out. Kitchens Baths & Beyond LLC did a very good job keeping us informed of the project status. I am satisfied with the end results from both projects [kitchen and master bath] and I would highly recommend this company. They completely remodeled our master bath. Jack, the owner, gets personally involved. He kept a close watch on the project and made numerous visits while the work was being done. We interviewed 3 contractors and KB&B was the best. The end result was spectacular. I can’t say enough good things about them. Jack and his crew did a wonderful job in remodeling of our master bathroom and closet. We even had his team improve the powder room. Once my wife & I saw his showroom, we knew that Jack was the one for this job. Jack and his team took 3 weeks and with a project complete, totally delighted us. We just had to wait a month or so, but once our date came up, there was no stopping his team. Having a remodeling job on a prior house of small guest bathroom (smaller than this master bathroom), the job took an excess of 3 months and cost us basically 1.5 times Jack’s cost. Jack was there from the beginning and helped in the design and layout of our “new” master bathroom. Way to go Jack!!! Remodeling can be a frustrating and exhausting experience as we found out from our first contractor. However, Jack and his crew from Kitchens, Baths, and Beyond made up for it all. They gave us a very fair price for very good material. They followed my dream to a tee and never questioned some of my over the top needs. They always came when they said they would and never left a mess. Last week when they did the last of the details I was more than pleased. If you are looking for a really exceptional remodel in Mt. Pleasant this is your company!! Do call them and don’t hesitate for a second. We are very new to the area and had a very bad experience with our first contractor but Jack, the owner of this company was a professional who made sure we not only got what we wanted but did it in a timely manner with an outstanding crew. Mark was an exceptional carpenter with Jimmy. Luis is a grand painter and the rest of the gang are a professional and trustworthy group. My bathroom is next. Jack and his professional crew were a pleasure to work with. They were helpful and respectful of my decisions. They completed our new kitchen quickly and were neat while doing so. The estimate came in close to the final cost and we would recommend them to anyone. We have had a bad experience in the past and proceeded with caution this time. We were very grateful that Jack was so honest and respectful from the beginning. Just wanted to say a BIG THANK YOU to Jack and his crew and Kitchens, Baths & Beyond for the courteous service. My wife and I had our kitchen remodeled, a complete tear out and install. They did a Fantastic job and were very fast. Jack did everything he said he would and then some, they really exceeded our expectations. We couldn’t be any happier, and I hope anyone who reads this gives them a shot, we will use them again for any remodeling we have done. The work started on January 5, 2015 with the removal of shower stalls, toilets, mirrors, cabinets, floor tile and parts of some walls and ceilings. New built-in ceramic shower stalls and floors, granite counter tops, cabinets, mirrors, lights, fans, painting, etc., was completed over the next three weeks. All of the workers – plumbers, electricians, painter, glass door and mirror professionals, and most especially, the tile installer – were excellent. Also, Brittany, Jackie, Gene and Jack Demsheck were good to work with. The job was completed in a surprising brief period, for which we were grateful. Of course any such project is disruptive while it is going on and it is sometimes annoying when you don’t know exactly when work will occur. But the final result is amazing. We invite friends to come and see our beautiful bathrooms and would recommend KB&B to anyone. KBB is a great company to do renovation with. I started with a Designer and quickly realized the kitchen would be beyond our budget. I then spoke with Jack the owner and Mark the cabinet maker and I know we could realize our kitchen within our budget. The quality of materials, the responsiveness of his team, the suggestions of Brittany on the design elements made this renovation easy. We will definitely do our bathrooms with this team of professionals….and they were fun to work with. We hired KBB to renovate our tired and dysfunctional master bathroom and closet. Though the work isn’t done yet, I have been totally impressed with their courtesy and professionalism. The workers have been very respectful of my home and special circumstances (they have been doing this work while I’ve gone through chemo for breast cancer), and the owner and project design team have been helpful, thorough and pleasant throughout the process. Even as I anticipate the completion of this project, I look forward to our next renovation together. I highly recommend this business! Excellent work! Finished on time. Professional, skilled and friendly! Just had my hardwood floors replaced and a bit of plumbing repair by Kitchen Bath and Beyond. What a great company to work with. Superior customer service and definitely went above and beyond to make sure we were satisfied. The absolute best thing was KBB could take care of all our needs with this home improvement project. We are going to truly enjoy our beautiful new floors. We will use Kitchen Bath and Beyond again. We highly recommend KKB. We recently changed our bedroom from carpet to hardwood floor. We are pleased with KKB showroom and services. Ross was very attentive to our needs, and exhibited excellent follow up through completion. 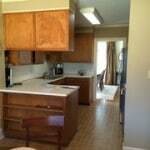 Jack and his team just completed my kitchen remodel and it looks great. 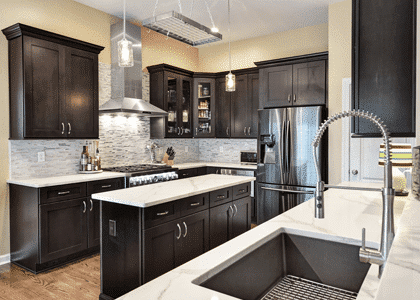 The professionalism, quality, and courtesy of everyone associated with Kitchens, Baths and Beyond is the highest. I will be doing bathrooms next and this is the company that I will be using. I recommend KB&B at every chance I can get to people I know in person. They completely renovated my kitchen a couple years go. New tile floors, new cabinets and hardware, new counter tops, new tile backsplash, new electrical (overhead, under cabinet, and a hidden microwave), new appliances, removed a small-non-load-bearing wall, minor plumbing, paint, worked with new appliances (we got appliances from Swift, at KB&B's recommendation)---everything! They finished on time (just over 2 weeks), on budget, at high quality, and a great experience. They didn't even get the rest of my house dusty or dirty in the process (and the kitchen is in the middle of everything). We still love it even 2 years after initial install. It still looks great and it's infinitely more functional than our original kitchen was. Exceeds expectations and very knowledgeable! Luxury Vinyl Tile for Russell S.
My wife and I interviewed three contractors to renovate our master bath. We went with KB&B and we are glad we did. Jack and his crew did a beautiful job. The reason we went with KB&B is because Jack has a showroom where you choose all of the materials you want (granite, cabinets, faucets, etc). No running all over town wasting your time to find what you want. Jack was very easy to work with. He made helpful suggestions to improve the end product. He also closely supervised the work done. I could always reach Jack quickly on his cell phone if I had a question. He is a straight shooter - no BS.If you are considering renovating your kitchen or bath, you will be pleased with your results from KB&B. There aren't many home remodeling companies out there that can give you the complete satisfaction that KB&B can. KBB doesn’t just meet your expectations, they exceed them. I had a kitchen gut and remodel the summer of 2016. New cabinets, counter tops, removed a closet to extend my counter top space, cut down a high half wall and extended the countertop to give me a 4 person peninsula seating area in the kitchen. I had natural gas brought in and new appliances. I was going to look into a flooring company to install hardwood downstairs after the kitchen was done. Jack said I really needed the floor in the kitchen before the cabinets went down or I risked damaging their work. I wanted my entire first floor and stairs done, he said he would do it. He wrote me a quote and got the wood and then completed the cabinets after my floors in the kitchen were down. The entire project was done in 6 weeks. I now have a beautiful kitchen I love to cook in and can interact with my guest sitting around the kitchen as I, or we, cook. The floors are beautiful, so beautiful I had them come back to do my upstairs hallway and 3 bedrooms. In Nov of 2017 they gutted my master bath. New tub, larger tiled shower, tile floor, cabinets and counter top, also wood floor and lights in master closet and wood floors in the master bedroom. Once again they did not disappoint. As I write this they are demoing my guest bathroom. Gutting and removing a linen closet in the hallway to make it part of the guest bath giving me another countertop and open shelf storage. Jack really is committed to making the customer happy. When they say they are here everyday early, no joke. They are here ready to work and work they do. All the staff are friendly and considerate of your home. I have heard horror remodel stories, workers come some days then you don’t see anyone for awhile, projects take months, over budget, etc. Jack is here everyday making sure things are done right and on time. Jackie and Brittany in the office are awesome. Jackie is so wonderful helping you pick out the materials and making suggestions when you feel overwhelmed. She calls and keeps you updated and there to answer any questions. Brittany is wonderful. For this project I really didn’t like what we talked about and the first set of plans. She called and we talked. She drew up a new option, which I love. Taking out the closet and giving me another counter top and storage is exactly what that smaller bathroom needed. I have one more bedroom to hardwood after I get it painted. Jack will have done my entire house then. I will be out of remodel projects after this. I cannot say enough good things about KBB, Jack, Jackie and Brittany. If you are looking for flooring or remodeling, they are the company you want. Timely, professional, quality. They will not disappoint you. I had a bathroom renovation, an updating of two smaller bathrooms, kitchen backsplash, fire place tiling, and flooring installed. I would highly recommend Jack and his team. They are very meticulous and consistently provide a quality outcome. Also, they communicate well and keep you abreast of the schedule. Projects were done in a timely manner. Jack has a terrific pool of specialty trade people. I would highly recommend them! We had a wonderful experience with Jack and his employees! Everyone was so professional and very concerned about customer service. The quality of work was excellent and completed in a timely manner. I would strongly recommend Kitchen, Baths and Beyond to anyone who is thinking of redoing their kitchen or bath! My wife and I highly recommend Kitchens, Baths & Beyond which we have used on two occasions . Six years a go they were the major contractor for our very successful kitchen renovation plus other miscellaneous interior improvements. Last month they completed a total renovation of our master bathroom. The results exceeded all expectations. I agree with other reviewers' comments about the friendliness, professionalism, and competency of the KBB workers. In addition, I believe a key success factor was our excellent up-front collaboration with Jack, Brittany and Jackie on the design issues of the project. The results are beautiful! I would highly recommend this company for your renovation work. I had a master and a guest bathroom completely renovated. Jack and the two designers are excellent to work with. The projects were finished in the time period quoted. The team of work people were polite and excellent crafts people. The clean up was very good. The designers are easy to communicate with, as is Jack. If I could give 6 stars I would! Prior to starting Kitchens, Baths, & Beyond in 2011, Jack Demsheck, the owner, operated his own remodeling company in New York for 18 years. Before that, he spent five years working directly with a master plumber and two years of advanced education. By keeping up to date on new trends and materials, he has been progressive within the remodeling field, specifically in Mt. Pleasant and surrounding areas. Demsheck’s amount of knowledge and experience aids the process and successfulness of each remodel. Kitchens , Baths, & Beyond was founded on the belief in creating a pleasant work environment for both the staff and the clients. Each project starts with a free in-home consultation where KB&B reviews the project and assures all needs are met in the final design. Our designers work hand-in-hand with the owner to give you the design you want on the budget you provide. From the beginning of the project, KB&B takes care in making sure each client has an exceptional experience. Numerous kitchen and bathroom displays can be seen in the Kitchens, Baths & Beyond showroom to provide visual inspiration when planning your remodel. In addition to the displays, the showroom contains material and products samples: cabinet doors, backsplash and bathroom tiles, wood flooring, plumbing fixtures, and countertops. KB&B specializes in being a one-stop shop to avoid the client going to four or five different specialty companies.